It's been cold and wet for much of the last week and I needed a reason to get out in the garden so an End of Month View tour was just the ticket. Brrrr, it was just a few degrees above freezing! That's a very cold afternoon temperature even for February. Just outside the front door....do I want to go out in this? Venturing a little farther along the walk. The Gopher Plant I copied from Pam at Digging is blooming and repeating the yellow of the Color Guard Yuccas in the background. Love this plant and plan to add more this spring. The watering can is not needed today! I'm training ivy around the lantern from Yeya's Antiques and Oddities. 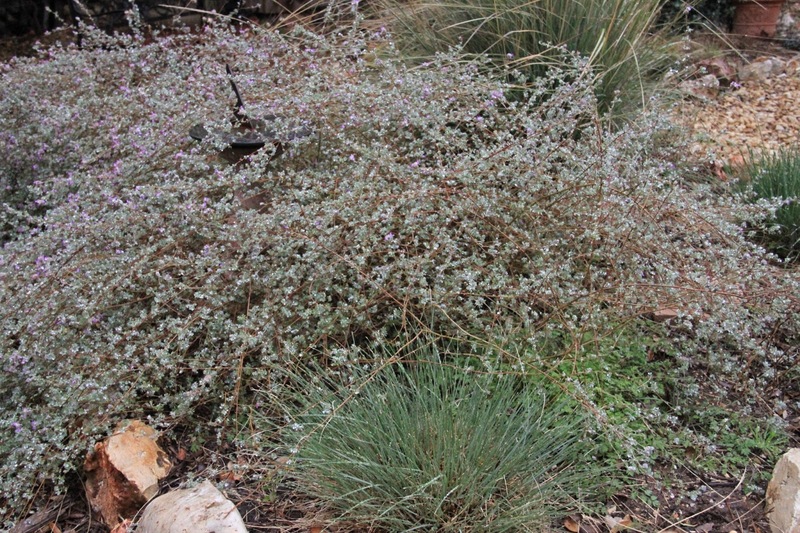 Salvia Indigo Spires in the foreground has bloomed throughout the winter months. 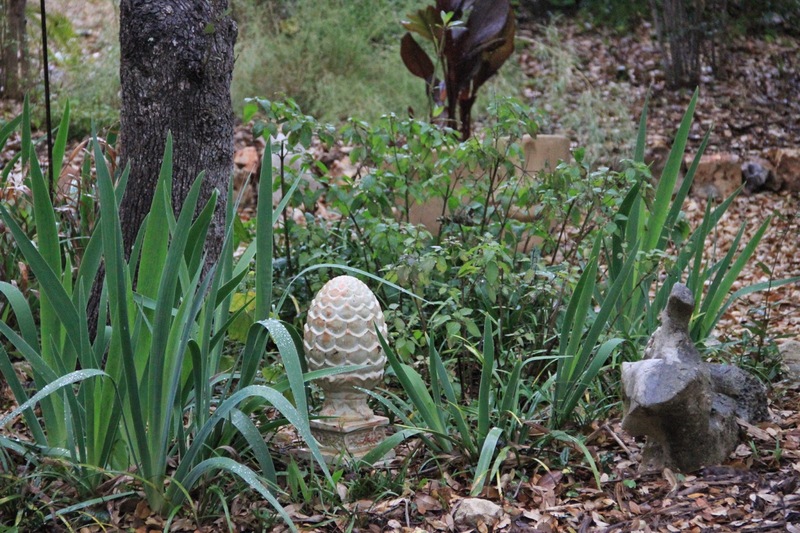 Pinecone finial from a thrift shop nestles in the iris bed..
Agave ovatifolia always shines during cloudy weather. 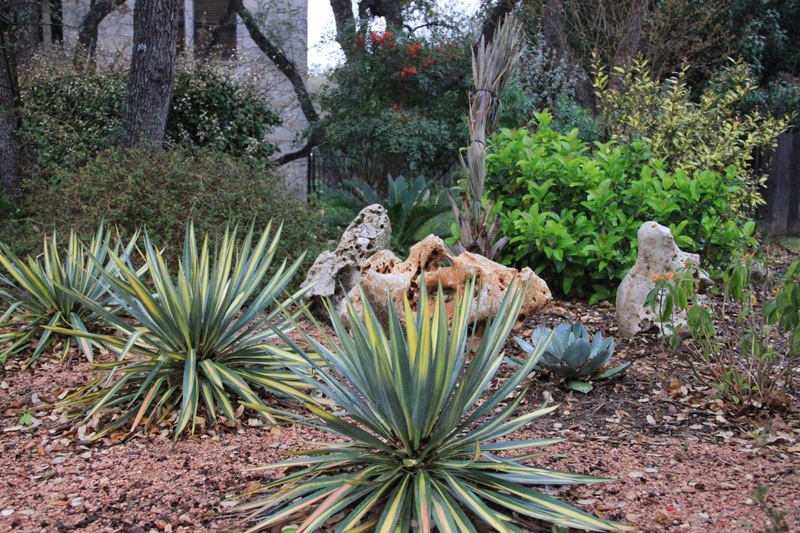 Color Guard Yuccas also seem to brighten up on gloomy days. 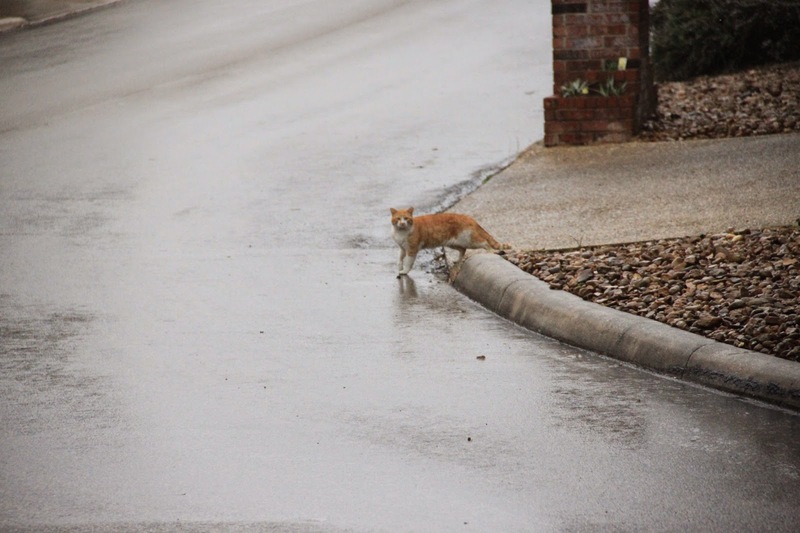 One of the neighborhood cats wonders what is going on, and if there is any food in it for him. Variegated Elaeagnus (back right) completing the yellow and green circuit that works so well with silvery plants. The Bismarck Palm is closed up ready to be wrapped if the temperatures go too low. Through the gate the deer fence across the back is progressing. 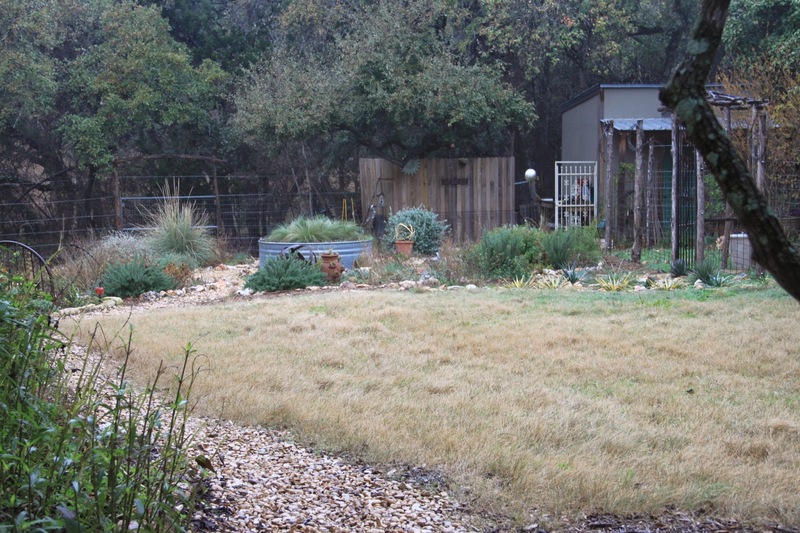 Wildflowers are the only green in the dormant buffalo grass lawn at the moment. The tank from my latest visit to Yeya's is getting settled. It needs to be leveled and filled but there's no work in the garden today. It's been set on an axis with the tank in the circle garden, which is a fancy way of saying they are lined up. 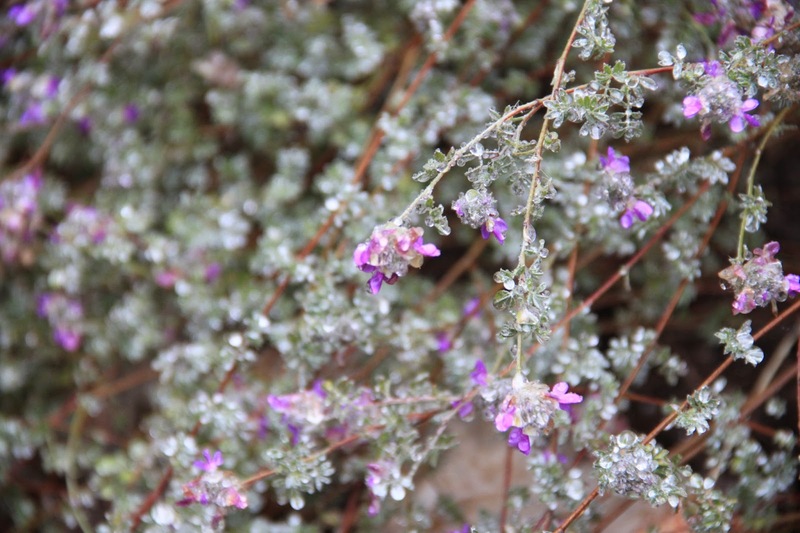 Blooming Gregg's Dalea is taking over one wedge of the circle. 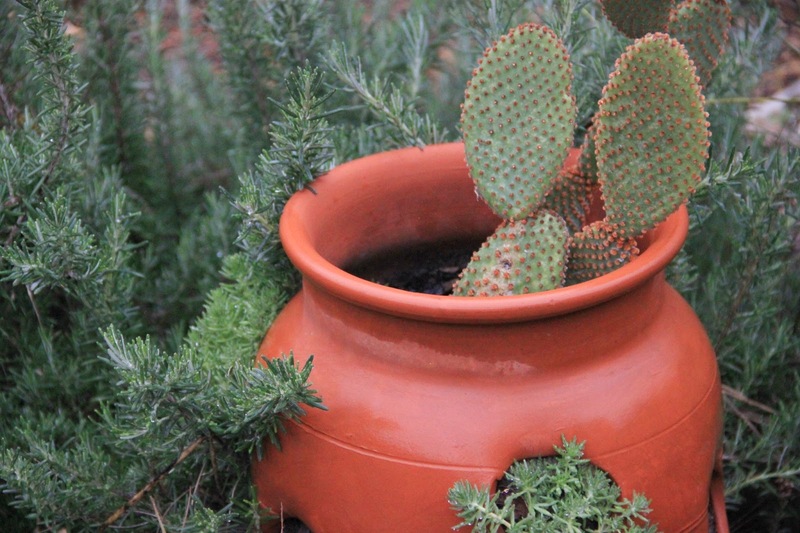 Cinnamon Bunny Opuntia hunkers down in its strawberry pot for now. I need to lift it and fill the top of the pot this spring. 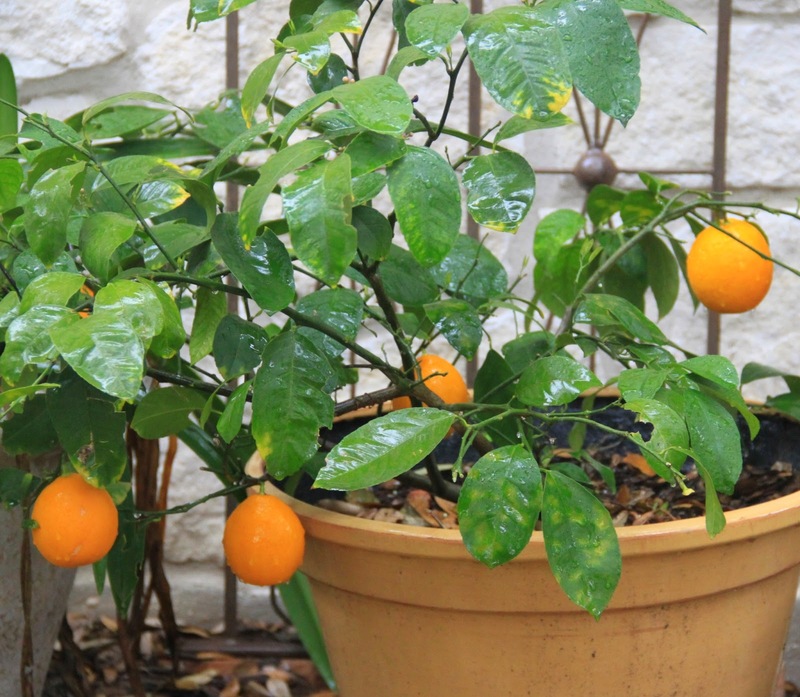 The lemons on the Meyer Lemon might be frozen concentrate soon. We brought this and several other plants out of the garage when it warmed up last week. 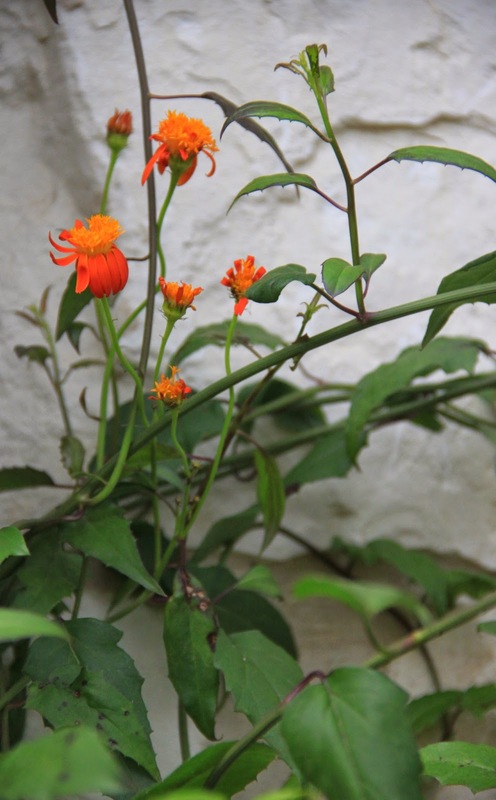 Mexican Flame Vine is blooming bright by the kitchen window. 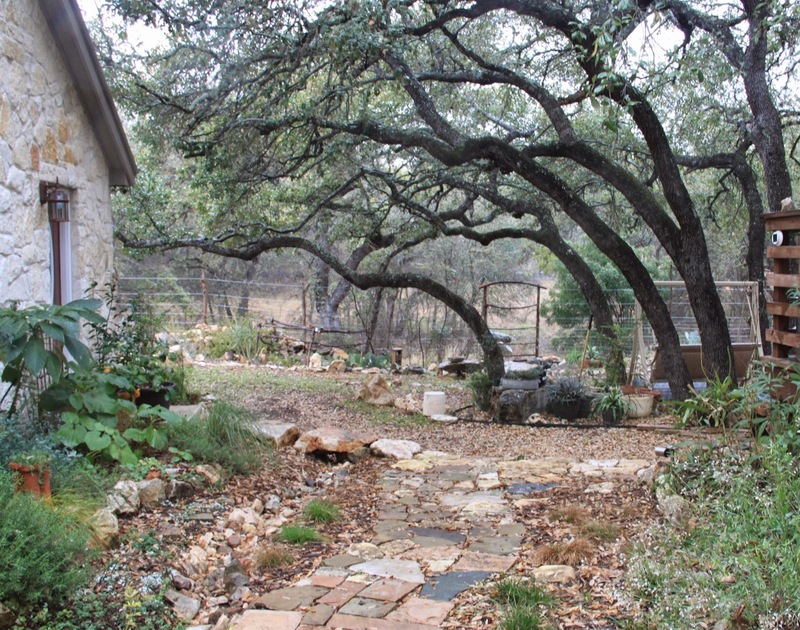 A last look over the back gate at those arching oaks. The Brugmansia did not freeze back this year so they should really put out the blooms this year. That's the tour for this cold ending to February. But overall it's been a good winter for allowing plants to continue growing since there were no deep freezes here this year. We should see temps back in our average 60 - 70F range soon. 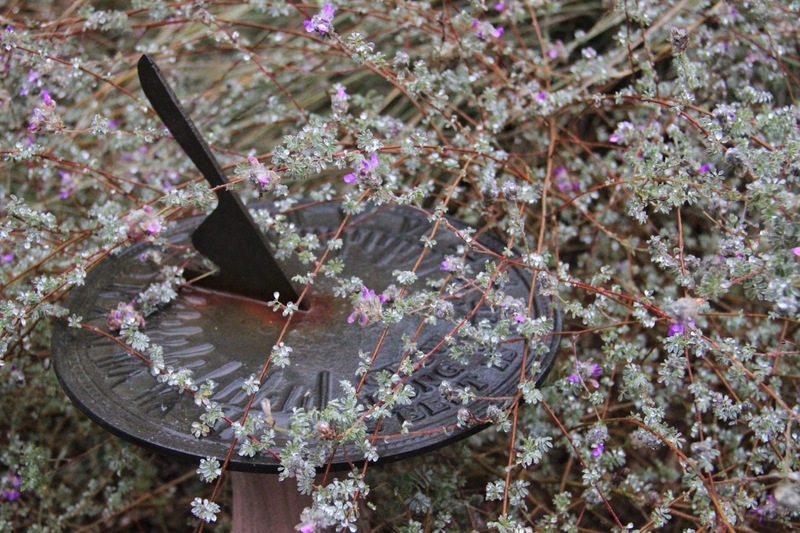 More End of Month Views from garden bloggers can be found at The Patient Gardener's Weblog. 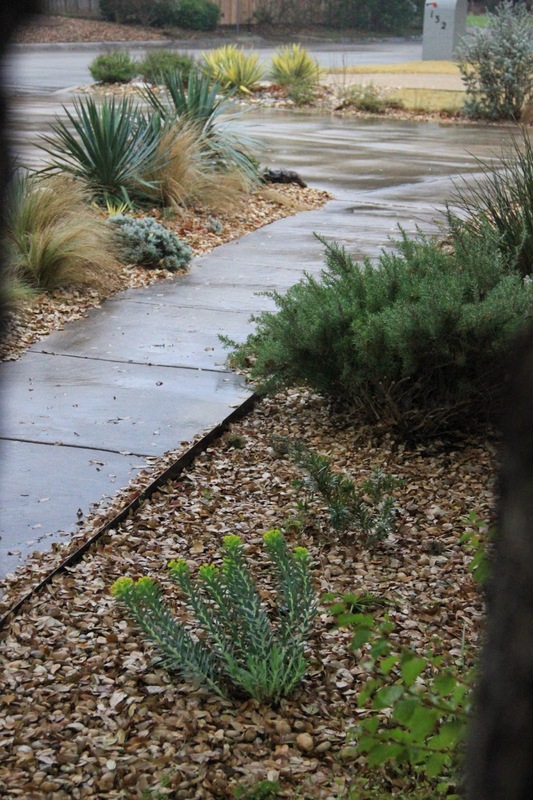 San Antonio annual rainfall cannot support a city of our size, so where does our water come from? 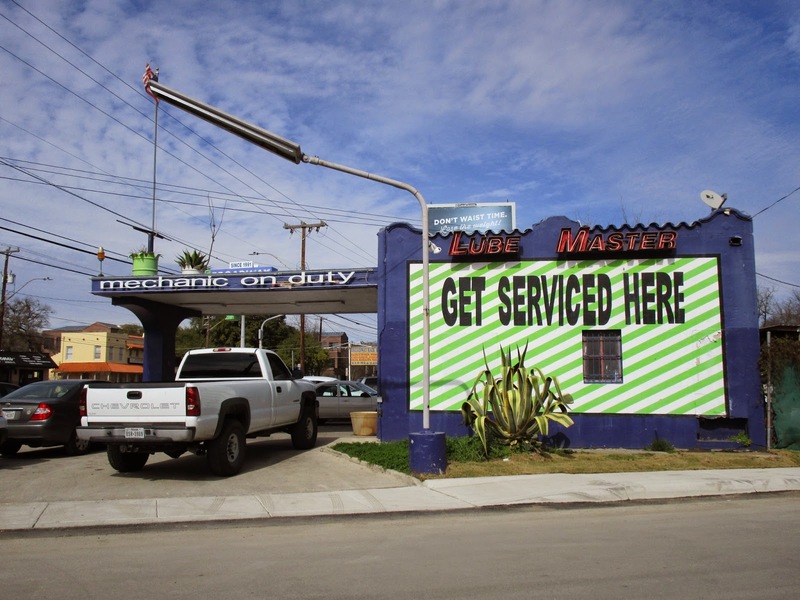 We are situated on the South Texas Plains near the Chihuahuan Desert and at best have a semi-arid climate, putting water at a premium. 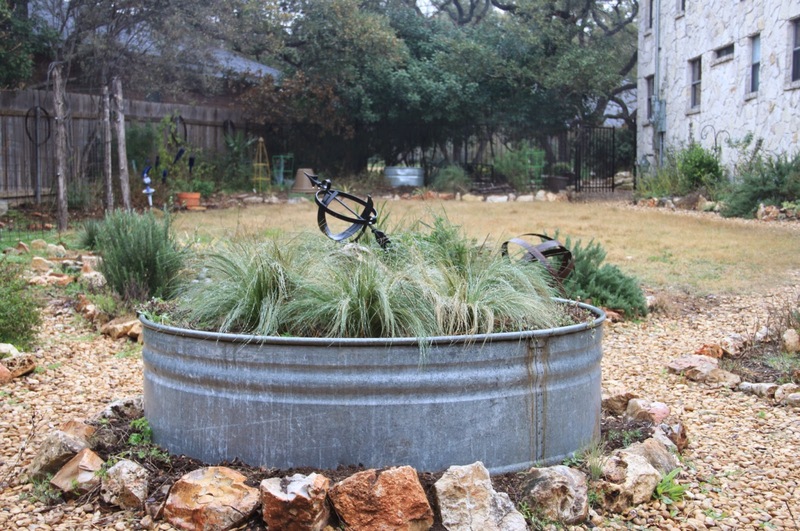 We get most of our water from a surprisingly large underground source known as the Edwards Aquifer which has been described as one of the worlds great natural resources, and our city could not exist without it. I was intrigued enough last fall to join about 40 interested residents, including engineering students from a local university, at the San Antonio Water System (SAWS) Conference Center to spend a day learning the story of our water system. In my previous post I discussed a new study to quantify how much water our landscape plants really require. 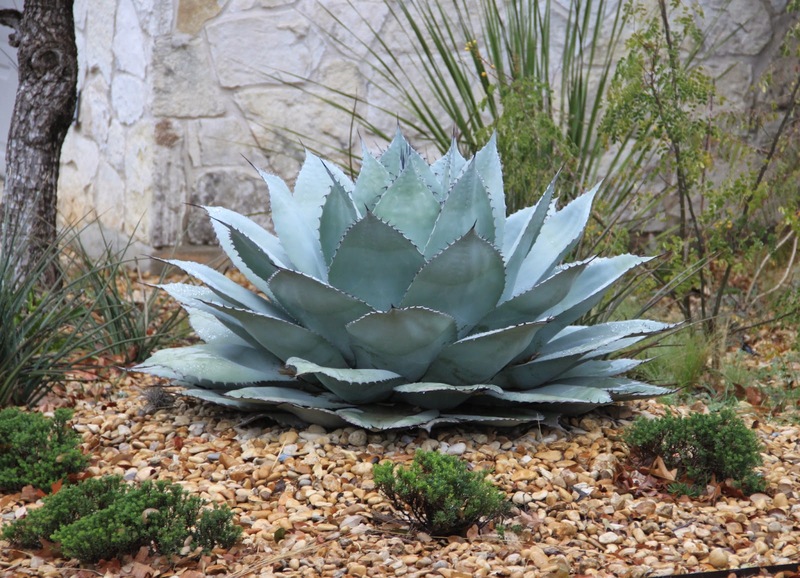 In this post I'll share the fascinating process of how San Antonio water goes from rainfall to our homes and gardens, since it is a unique story. 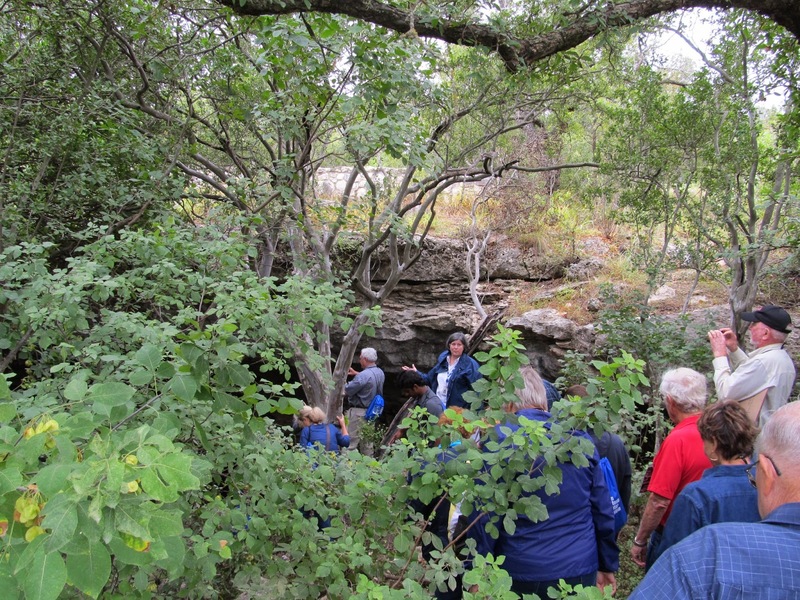 After an introductory talk from our SAWS guides we were on our way by chartered coach to Stone Oak Park in far north San Antonio for the first stop on our tour and the answer to the first of our questions about the aquifer: how does water get into the underground aquifer? Our guide invited us to explore Cub Cave in the park to see the first steps in the process. 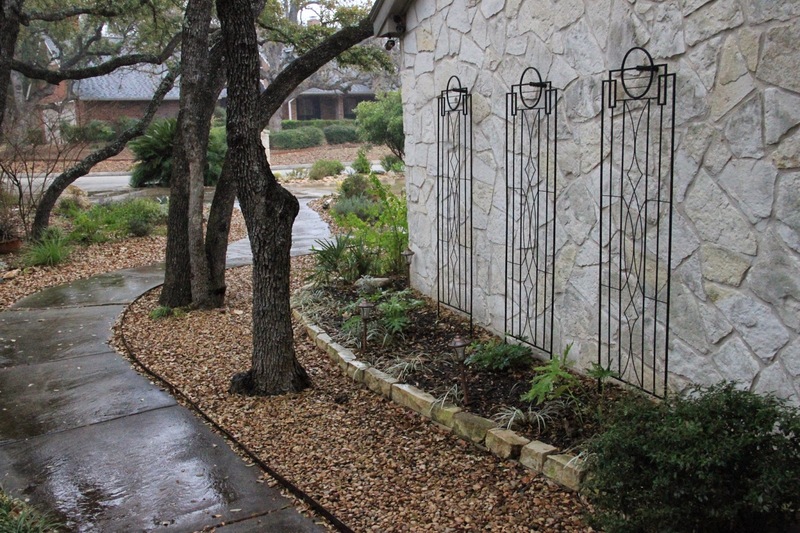 Just how much water is required to keep landscapes looking good through a drought in Central Texas? Or is the question really "good enough" during such times? These are questions our region has been grappling with during several years of extreme drought conditions. The challenge is more than lack of rain since our growing population increases the demand for water, while landscapes are a major drain on water resources. 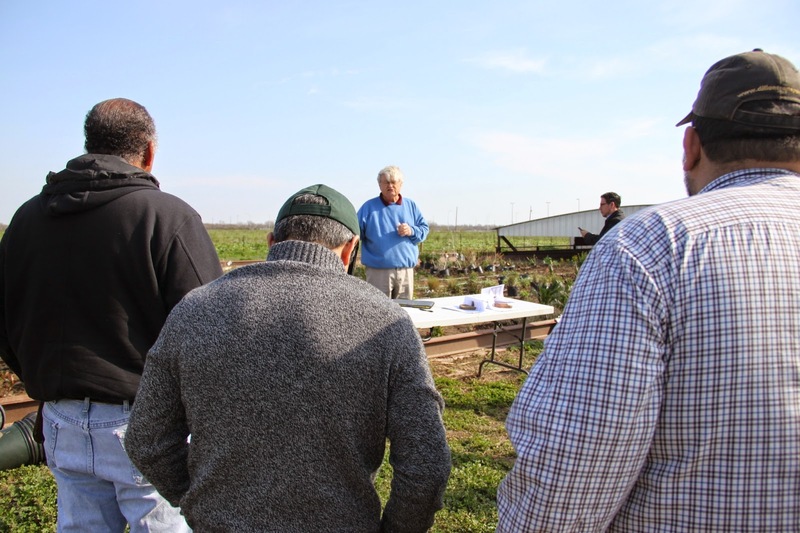 Last week my friend Melody and I traveled down to the Drought Simulator southeast of town to learn more about a new research project headed by Dr. Calvin Finch of Texas A&M's Institute of Renewable Natural Resources. 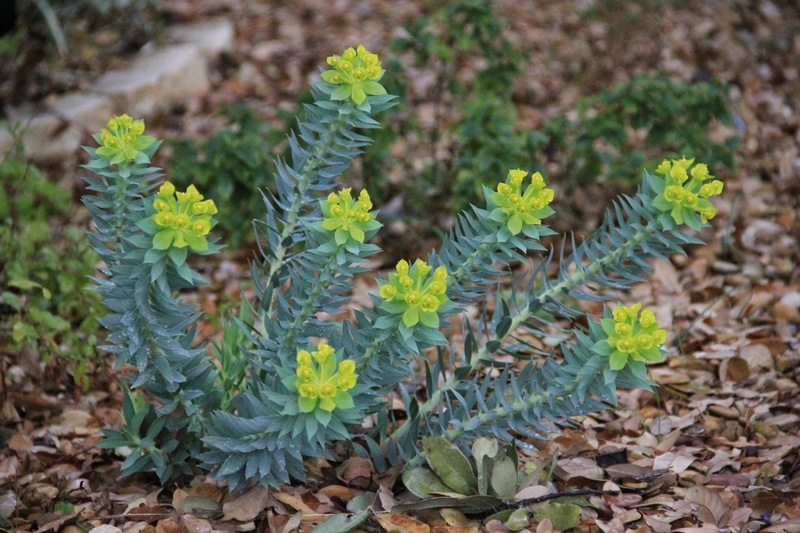 This Drought Survivability Study will enable researchers to document the performance of 100 of our most popular landscape plants under different drought conditions. 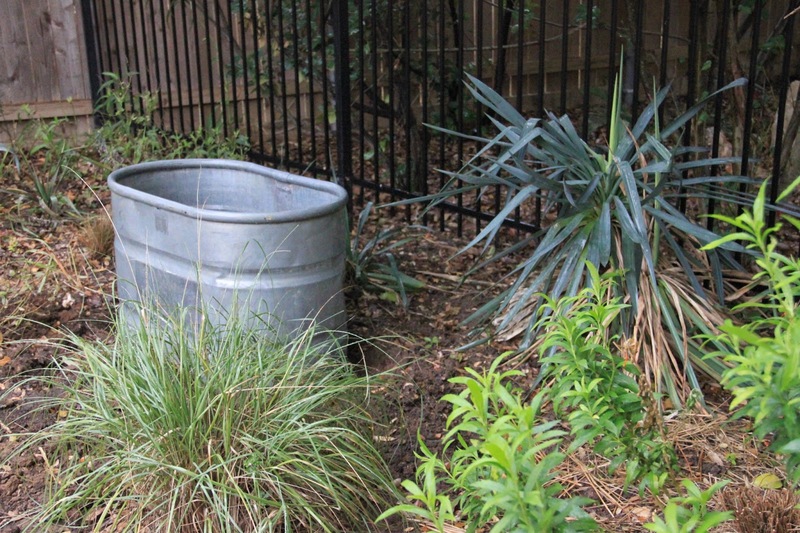 The study is sponsored jointly by the San Antonio Water System (SAWS), the cities of Austin and Georgetown, and the San Antonio River Authority (SARA), as well as Texas A&M. Dr. Finch opened the presentation with an overview of the study. I was particularly heartened to hear that Dr. Finch, horticulturist and gardener, is placing importance on keeping our landscapes looking good during drought while conserving water. According to materials received at the meeting, currently available research indicates we may be overwatering our plants. Having no idea what I would post for Foliage Follow-up until this afternoon, I spotted this scene as I drove up Broadway, a major thoroughfare in San Antonio. Quickly cutting (safely) over a couple of lanes to make a quick right, I rolled to a stop and snapped away with my new pocket camera. I had noticed it a number of times and even thought to stop "sometime". Sometime was today and isn't this fun? 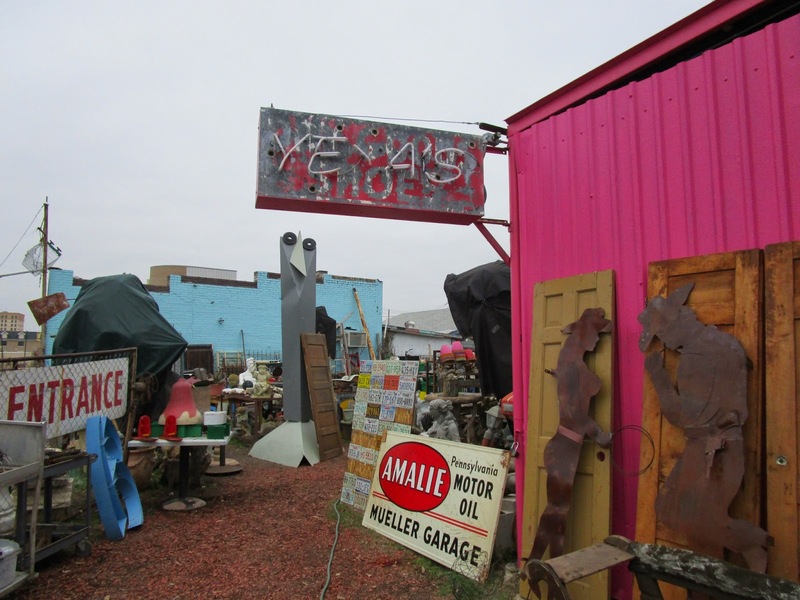 It's been a while since we visited Yeya's, one of my favorite places to hunt for garden junk. 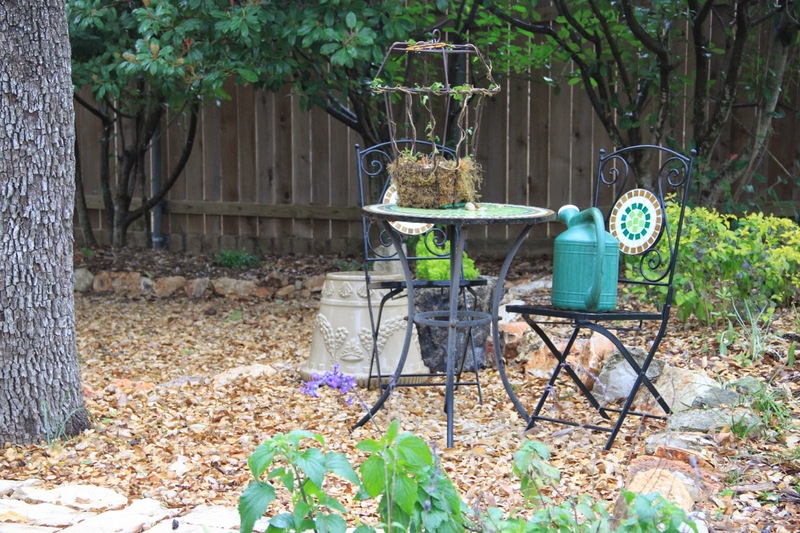 With the weather a bit cool and wet for gardening it's a good time to add to the collection for the coming gardening season and take you on another tour. I haven't shown you what's new for a while but doesn't mean I have been shopping Yeya's! A cool cloudy day is the best time to visit and take photos because it can get very hot out here in the sun. So what's new at Yeya's besides that bright pink wall? Here are just a few of the things I found last week when I visited. 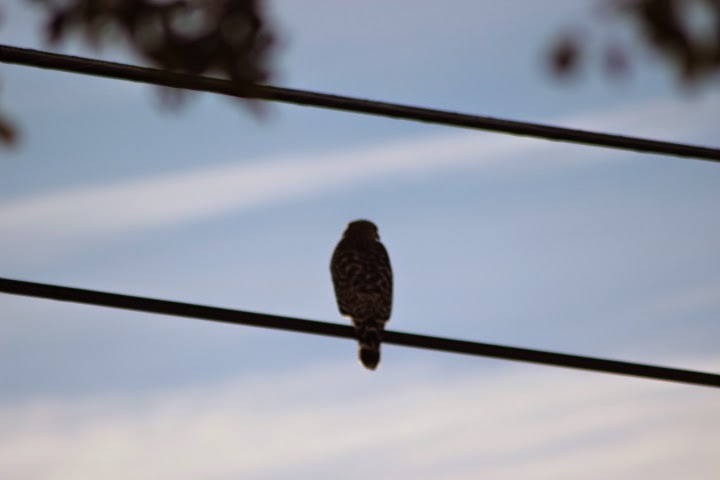 Wildlife Wednesday February 2015: Hawk on a Wire! Almost every day we hear hawks screeching as they hunt the field out back. We see them soaring gracefully along the woods, searching for their prey. Occasionally they dive into the tree tops in pursuit, creating a commotion and cries of protests from their intended targets. Rarely will a hawk come close enough to the house where we can get a good look. That's why it was such a surprise to see one sitting on the wire out front. I'm joining Tina at "My gardener says..." for Wildlife Wednesday this first Wednesday in February. 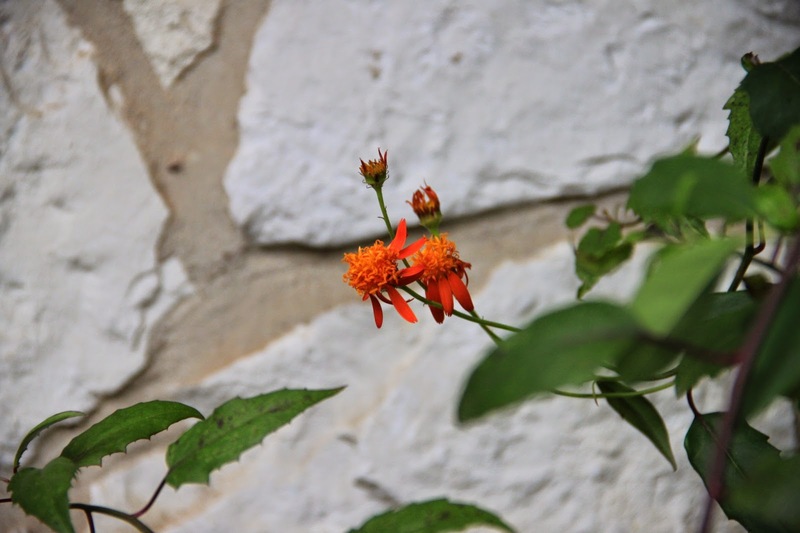 Way back in May of 2014 I joined in with the Austin bloggers for the Gardens on Tour event sponsored by the Lady Bird Johnson Wildflower Center. You can read about the first two garden stops on our tour here and here. With more wintry weather still ahead in February, it's fun to look back at warmer, sunnier days in a garden. 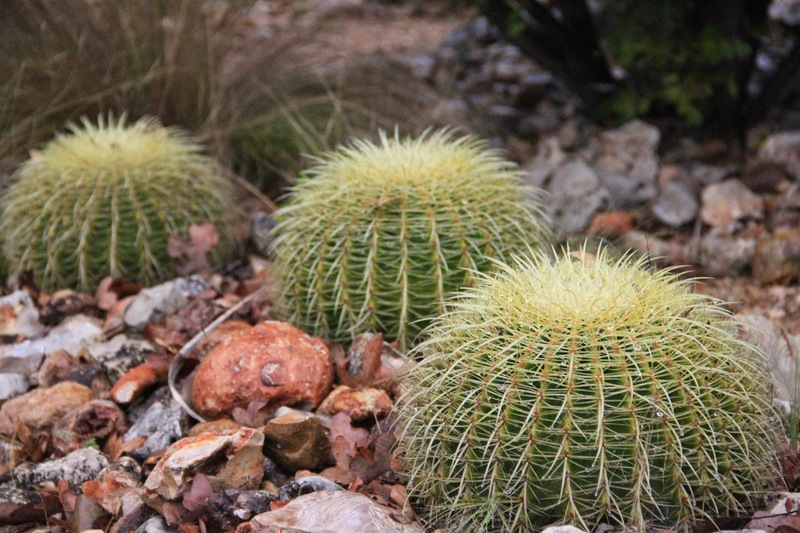 The Rockcliff Road garden, just west of Austin, is very naturalistic--making it fun to explore but not quite easy to translate to the blog. 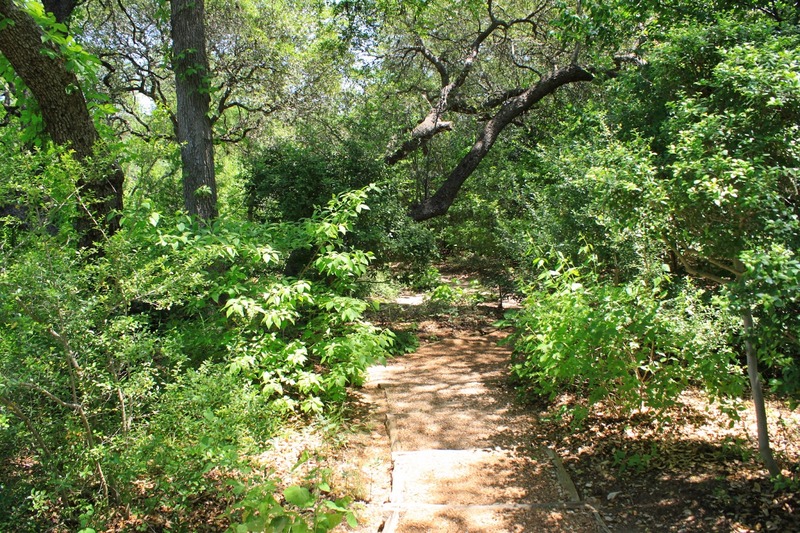 A live oak shaded path greeted us just inside the garden walls. 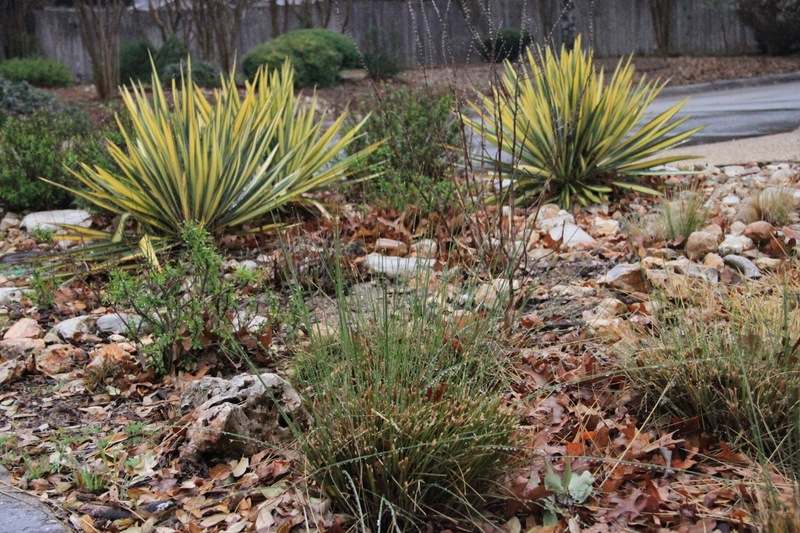 Native plants have filled in the understory spaces in striking contrast to the typical oak-studded lawns of our area.